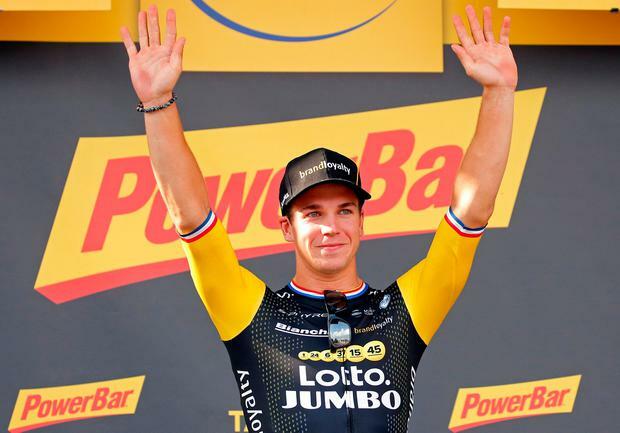 Dylan Groenewegen clinched his first stage victoryof this Tour de France in a bunch sprint on the streets of Amiens, attacking around the outside of Peter Sagan and Fernando Gaviria to win by five metres - and he delivered a message to his critics in the process. The talented Dutch rider timed his move to perfection, powering towards the line with 100 metres to go to leave his rivals behind and raising a finger to his lips as he crossed the line, a response to those who have doubted his form so far in the Tour. The general classification contenders like Chris Froome and Richie Porte all finished safely in the bunch, and Greg van Avermaet extended his yellow-jersey lead after earning three bonus seconds during an uneventful day. Friday's stage winner Dan Martin stayed out of trouble and finished in the bunch in 53rd position. He remains 21st overall, one minute and 30 seconds behind Van Avermaet. This was the longest stage of this year's Tour, a 231km route across northern France from Fougeres to Chartres, and for most of the day it felt that way. Yoann Offredo and then Laurent Pichon attempted solo breaks but were gently reeled in by a peloton happy to take it easy before tougher challenges ahead. "Maybe they should just have stages less than 200km in grand tours," suggested an unimpressed Thomas afterwards, who remains second overall. "It would be a bit more exciting for everyone I think. Moments "There were a few moments where a few teams tried to get away but no one really wanted to do anything. It was over six hours in the saddle but obviously it's easier than racing full gas. One more day, and then a big day on Sunday," he said, referring to the treacherous cobbles of stage nine which will not be so forgiving. With 40km to go, as Amiens approached, the race finally seemed to ignite when Thomas De Gendt and his Lotto-Soudal team injected the charge which swallowed Pichon, but from there the peloton took the chance to take their foot off the gas again. It was one of the more curious finishes to a Tour de France stage with no one prepared to test a final breakaway, against the various sprinters' teams full of fresh legs which would have easily hunted down any break, and so 170 riders floated through Amiens like a cloud. Andre Greipel's Lotto-Soudal moved on to the right of the road, Gaviria's Quick-Step Floors took charge of the left, with Mark Cavendish's Dimension Data on their shoulder, while the GC contenders like Team Sky, BMC and Movistar filed in behind. Once the GC teams hit the 3km mark and their times were locked in, they stood down and let the sprinters have their moment. French rider Arnaud Demare moved up to the front but was quickly swarmed by Quick-Step as they dragged Gaviria through to the front. But this time the Colombian was overpowered, and not by the green jersey of Sagan but by the man who won on the Champs-Elysees last year, Groenewegen.